The Gillette Milady marks a unique time in the world's history, specifically for women. The suffragette movement is in full swing and women are wearing more revealing garments. At least for the society women, sleeveless dresses are all the rage and the expectation of a smooth white underarm is of upmost importance. Before Gillette invented the Milady razor sets women would call upon a trained nurse who could wield a safety or straight razor. It is assumed women (just as we do today) would have stolen their man's razor. These women were discreet about any unwanted hair removal and creams were used for years before this time. 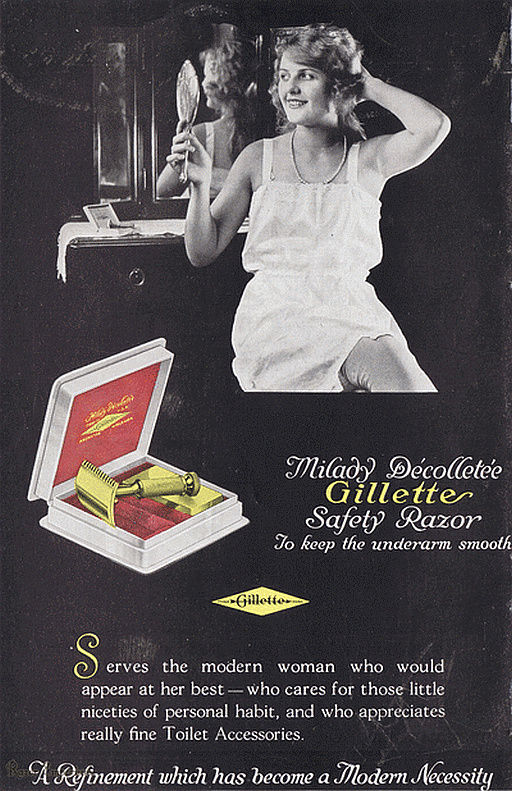 Women are seen to be angelic and gorgeous creatures who emerge from a shell smiling and hairless... Gillette's introduction of the Milady Decollete certainly made this image easier and safer to obtain. Watch the video below for more information on these dainty razors!